Apple Inc’s manufacturing partner Foxconn Technology Group has frozen hiring at a Shenzhen plant that makes gadgets including the iPhone 5 and put the brakes on recruiting for other factories across China, but said the move was not linked to any single client.Foxconn runs a network of factories across the world’s No. 2 economy that make products for tech companies from Hewlett Packard to Dell. It sought to pour cold water on a Financial Times report that it had imposed a hiring freeze while it slows production of Apple’s latest smartphone. “Due to an unprecedented rate of return of employees following the Chinese New Year holiday compared to years past, our company has decided to temporarily slow down our recruitment process,” the company said in a statement. Like other Chinese contract manufacturers, Foxconn, the trading name of Taiwan’s Hon Hai Precision Industry Co Ltd, relies on a large number of migrant laborers from across the country who journey home for the most important holiday of the year. Many do not make it back to work, but Foxconn spokesman Louis Woo said this year they saw as many as 97 per cent of employees return. 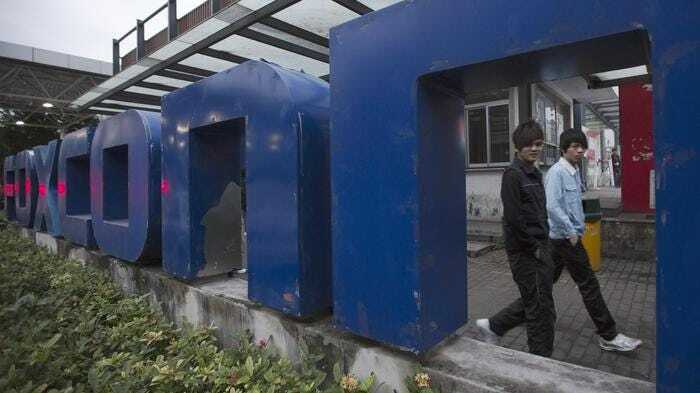 A Foxconn recruitment centre in an industrial suburb of Shenzhen, where job-seekers register their names and mobile numbers, was closed on Thursday. Apple sold a less-than-expected 47.8 million iPhones in the 2012 holiday quarter, fanning fears that its dominance of consumer electronics is on the decline as Samsung Electronics Co and other manufacturers that use Google Inc’s Android software gradually gain market share. The iPhone is Apple’s most important product, accounting for half its revenue. The company’s shares slipped almost 2 pct on Wednesday to $451, and are down about 34 per cent from their September peak above $700, as investors fret about sliding margins and intensifying competition. Apple watchers often take cues from its component suppliers and manufacturing partners. In January, CEO Tim Cook took the unusual step of warning investors that it is difficult to extrapolate from limited “data points”. RBC estimates that just 70 to 80 per cent of Chinese workers return to factories it tracks. “This year we believe the return rates have been closer to 90 per cent, which may minimize the need to hire,” RBC analyst Amit Daryanani wrote in a Wednesday research note. A check on Foxconn’s recruitment website on Wednesday showed the company’s Taiyuan and Hangzhou plants were hiring. But its factory complex in the southern city of Shenzhen is its single largest production base. The Shenzhen plant “is not hiring at the moment because workers’ return rate after Chinese New Year is very high this year, reaching 97 pct”, Woo said.